Cableguys has updated VolumeShaper to v4.2 and PanShaper to 1.1, adding independent settings for LFO & Mix controls. Every week, MeldaProduction offers four different plugins at half price. Here is their pick for this week. The Plugin Alliance has chosen the Elysia Nvelope as their "plugin of the month", making it available for $89. 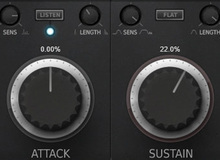 Audiority has updated its TS-1 Transient Shaper plugin to v1.1, adding a new mode on the way. Version 8.5 of the UAD Software is now available, featuring new plugins by Brainworx, Softube and Sonnox.